Over the past 20 years, Alice Malach has developed a passion for rehearsing and conducting choral ensembles. She was first introduced to choral music through the inspirational teaching of Mary Legge at Earl Haig Secondary School, where Alice attended the Claude Watson School for the Arts as a piano major. This led to choral conducting studies at the University of Toronto’s Faculty of Music with Doreen Rao and Wayne Strongman, and summer choral studies at Westminster Choir College in Princeton, New Jersey. As an accomplished pianist and conductor, Alice has worked with numerous children’s choirs through the Toronto District School Board, the Royal Conservatory of Music, and the Glenn Gould School. 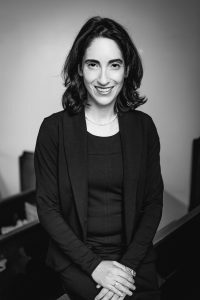 Through a long-term affiliation with Toronto’s Jewish choral community, Alice has conducted Temple Sinai’s youth choir and has worked as both adult choir director and accompanist for Temple Emanu-El. Alice teaches with the Toronto District School Board at Northlea Elementary School, where she co-directs their award-winning choirs. She holds an Artist Diploma in Piano Performance and Pedagogy from the Glenn Gould School, an A.R.C.T. diploma in Piano Performance, and a Kodaly Pedagogy Certificate. In 2014, Alice was nominated by the Ontario Arts Council for the prestigious Leslie Bell Prize for Excellence in Conducting.